SlugisDoug episode 63: Jeepers Creepers! 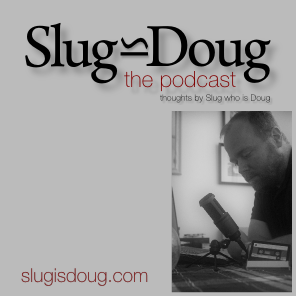 SlugisDoug episode 50: Happy 65th Scarborough Dude! SlugisDoug episode 39: Clash Jam Boom! SlugisDoug episode 31: Stuckin` Traffic! SlugisDoug episode 25: Sleepy Time? SlugisDoug episode 15: Still here. Still dreaming. SlugisDoug episode 13: May the 4th be with you. SlugisDoug episode 9: A side of Cynicism with that? A Plan, of which, Hannibal Smith* Would be Proud. Is it just because you catch Ice? A Map to the Border. What is this Slug is Doug?